Now that September has arrived and August is in the rear view mirror, I think I will just go ahead and say that August was mostly a no-good-very-bad-month. 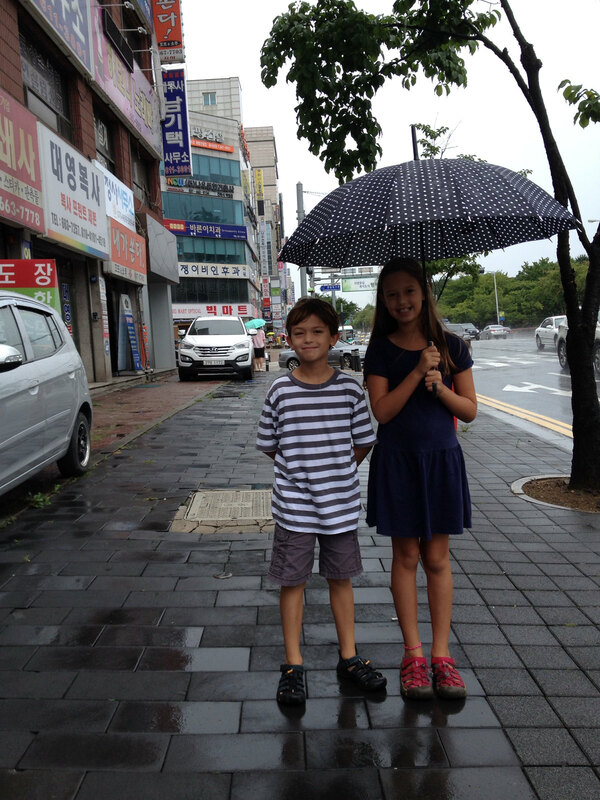 We arrived in Korea on August 1st. I believe I already mentioned the MERS + jetlag combo that marked our first 2 weeks here. Also present were sticky-hot days with 1000% humidity. We managed one enjoyable, post-acclimation weekend together before the base began it's big yearly joint exercise with the South Korean military. Josh was working nights and sleeping days on the base. The kids and I were on our own here in the apartment complex. Number of friends and/or polite acquaintances: Zero. Ability to get around: Low. We only have one vehicle and it was too dang hot to walk anywhere. The kids and I, lacking anything else to do, started school. It's been a learning curve for us all, but mostly for me. I found myself up late each night preparing for the next day and trying to establish a routine that works for us. We are getting there. Then, if you are readers of the news, you will recall that things became quite tense on the peninsula. That guy up north started making threats. People from the base began reminding the families here of evacuation protocol. Josh's work hours grew, but no longer because of an exercise. I pulled a suitcase back out of the closet, and placed the gas-masks by the front door so I wouldn't forget them. I read the news, prepared school lessons, and wondered what the heck I was doing here. Then, because his timing is always perfect, Derek got pinkeye and I got the opportunity to make a fool of myself trying to get him seen by a doctor. That could be a whole post unto itself, but with pantomime and dragging him up to people and pointing to his eye, we eventually got him seen and got some medicine. Turns out it must have been the viral type, because his eye did not respond to the antibiotics and the red eye endured for over a week, until it cleared up and the other one started in. Pinkeye = no swimming. Frowny face. So that was pretty much August. The good news is that tensions have died down, I put the gas masks away, and Josh has 2 weeks of leave to start September. 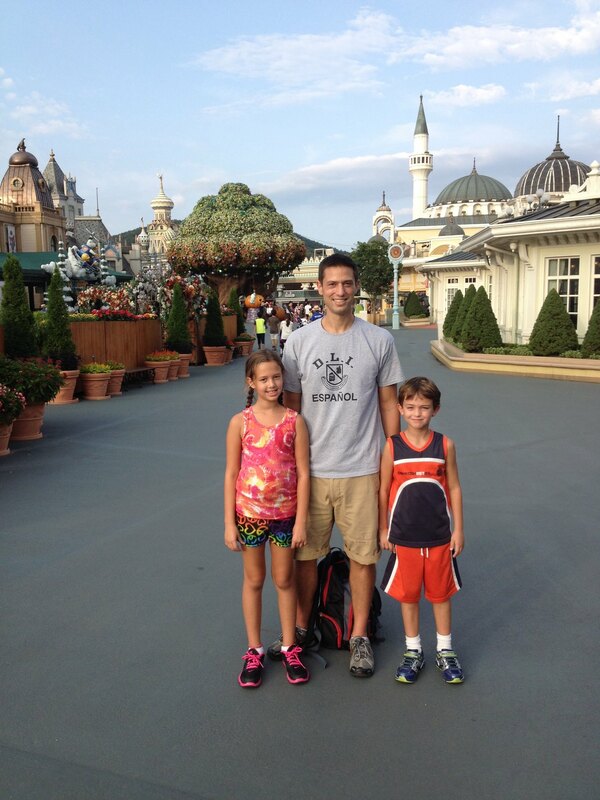 Yesterday we surprised the kids with a trip to Everland amusement park which is just under an hour's drive from us. It reminded me of Busch Gardens. It had a very scenic, mountain setting. We would have preferred to wait until the weather cooled off a little more, but we can't always count on Josh getting leave so we just went for it. A good time was had by all. By the end of the day I realized I had seen only one other non-Asian looking group in the whole park. I'm guessing we stuck out a little. Good thing we are such avid theme-park-goers, because we just assumed that most of the instructions we could not read or understand were saying things like, please keep your arms and legs inside the vehicle at all times. If not, well-- we survived. 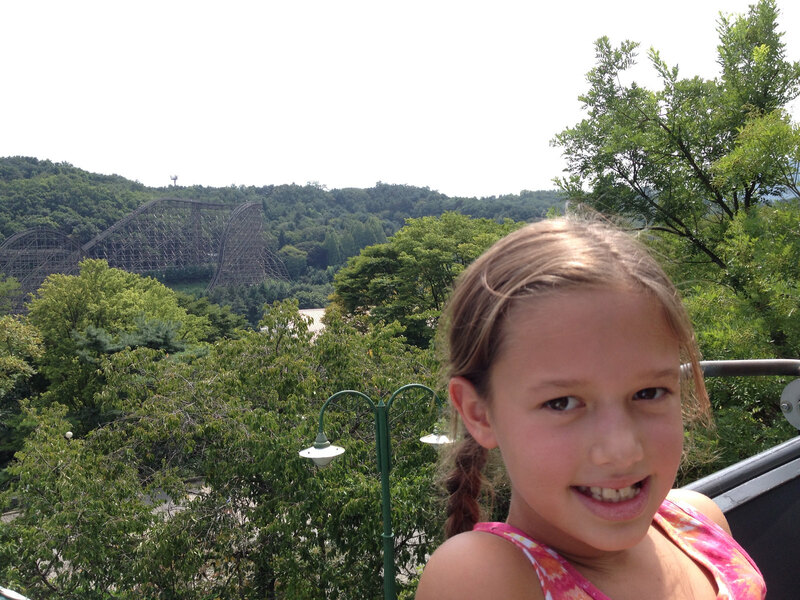 You can see Alex's favorite ride in the background-- a large wooden roller coaster with quite the steep drop. She and Josh rode it twice together, a third time with me, and Derek said no way. Today we packed our bags again, because tomorrow we're off to explore more of Korea. We're going to spend some time touring in Seoul and then we're flying to Jeju Island off the southern tip of the peninsula. Yes, you read that right. I'm getting on another plane. But this flight is only an hour and I'm not changing any time zones, so hopefully all will be well. We've heard Jeju is called "the Hawaii of Korea." And while I'm looking forward to some pretty sunsets and waterfalls, they also said that Everland was "the Disney of Korea", and I have to say that's being a little generous.